Dental implants are ideal replacements for missing teeth, as they look very natural and function like your own teeth. They provide the capability to chew every type of food and can be implanted in front or back for as many teeth as are missing. They come up through the gums and look as if they grew there! Those without any teeth can also benefit, because dentures can often be replaced with implants. They have the advantages of stability – no more slippage and tilting! – and do not need to be removed at night. 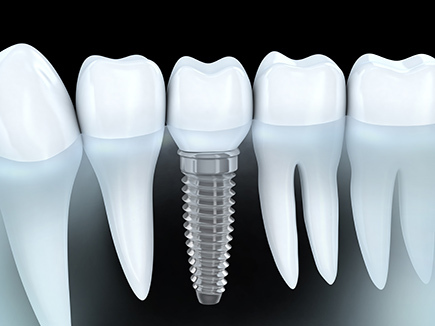 We handle the complete process from post implant to crown fabrication and placement, so you will not be inconvenienced to go to another office. Forget about the worries of slipping dentures. We design natural-looking dentures that don’t slip! We can anchor the denture plate snugly to eliminate embarrassing shifting or slipping. If you wear dentures, you will want to learn how this procedure can make your life more comfortable and easier. We have the latest advancements in dental technology and are pleased to be among the first to offer 3-D cone beam CT digital imaging technology. This provides a three-dimensional image that is far more accurate than X-rays. There is less radiation than traditional X-rays, and it is a much quicker process. Being able to see a patient’s anatomy in 3-D allows more accurate diagnosing than what two-dimensional images provide. This is especially helpful in implant placement and oral surgery. Don’t live with missing teeth any longer! Call 763-972-2800 for a no obligation implant consultation today to determine your suitability for dental implants.